While many experts preach their love for Epsom salts, I have been a long-term fan of Himalayan Detox Salts from Michelle Roque-O’Neil, which truly are magical and treat anything from stress to coming down with a cold, so I know that 84 minerals that those magical salts contain are worth every grain. 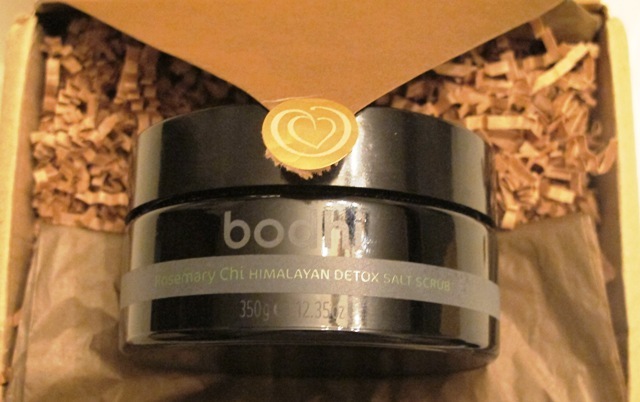 When I heard from Elijah Choo, founder of Bodhi skincare that he was due to launch an addition to his Artisan series, called Rosemary Chi Himalayan Detox Salt scrub, I got beyond excited because even before I tried this product, I knew that it will be everything I expected it to be and more-mistaken I certainly wasn’t ! The scrub itself contains Himalayan salt crystals that are hand-harvested from the Kashmiri Himalayan mountains. Elijah believes in hand-blending in small batches and using minerals and botanicals that he chooses for their potency and holistic, as well as skin/bodycare benefits. I think what makes the whole Bodhi range very special is that Elijah has boundless creativity and seeks inspiration and ideas from not just the countries around the world, but beauty, botanicals, medicinal traditions & remedies. According to Bodhi press release, accompanying Rosemary Chi Himalayan Detox Salt scrub, ”Himalayan Salt Crystals contain the full spectrum of 84 minerals and trace elements that are essential to human life. Formed 250 million years ago, the powerful mineral salt boasts healing energy to help re-balance the body and flush the toxins” that we all accumulate on the daily basis. Bodhi managed to utilise ”unique mineral ions to help equalize the body’s bio-energetic fields, stimulate cell regeneration, enhance lymphatic flow and induce meditative sense of calm”. Himalayan salt crystals are combined with a synergestic ( such a popular beauty word this year ! ) blend of Rosemary ( nature’s detox remedy, as it boosts liver function and helps to remove cancerogens. It also acts as a brain and nervous system tonic ), Geranium ( it helps to cleanse our lymphatic system ), Petitgrain ( helps to calm the mind, as well as clear the skin ) and Cedarwood ( it is a good anti-septic and is known for its diuretic properties as well ) essential oils that help to revive and balance the senses- I can happily confirm that, as I am inhaling the scrub’s aroma, while typing this article, all in the name of giving you a very distinct, personal experience ! There are also anti-oxidant Grape seed oil ( it also helps to stabilise collagen and management of elastin that we start loosing in our 30s. It also encourages production of hyaluronic acid that keeps our skin supple ), Organic shea butter ( rich in Vitamins A and E, it softens and nourishes the skin ), Olive Squalane ( protects and strengthens the skin matrix, preventing oxidation, free radicals damage and slowing down the ageing process-hence a snake like experience of shedding old skin in the shower .) and Apricot Kernel Oil ( naturally rich in Vitamins A, B1, B6, B17, E, as well as oleic and linolenic acids, all of which help the skin to retain elasticity and suppleness ). I have been using thing wonderful scrub for a few weeks now and I have to say that it is a Body Beauty Keeper on a major scale. It makes the skin look renewed and supple, without stripping it of the vital moisture, it relaxes your mind and clears your head and it enveloped you in a wonderfully fragrant, protective cloak that is both nurturing and encouraging at the same time. It really is a multi-tasker that surprises me every time I open the jar and inhale its aroma. You don’t need to go to the spa, you create your own sanctuary in the privacy of your own bathroom, where transformative magic happens. Some scrubs are too soft and some are too harsh and this one really delivers, so for now my search for the best scrub is over-spring or winter, I know that my body is ready to deal with day’s intricacies that lie ahead. All Bodhi products are free from petrochemicals, silicone, parabens, carbomer, acrylic-polymers, synthetic colours, fragrances or animal ingredients. All product ingredients are ethically sourced from sustainable origin.